The SpeedyLam 330R10 is the fastest pouch laminator available on the market today. It will laminate up to 12 feet per minute with just a push of a button. This allows you to run a letter sized pouch every 5 seconds! This is unique 10 roller system comes with: 6 heated rollers, 2 cooling rollers and 2 outlet rollers which allows for super-fast lamination speeds. The unique rollers assure high quality results even on difficult laminate items such as photos, inkjet prints and color copies. The patented cooling system keeps the exterior of the laminator cool to the touch even when doing long production runs. The SpeedyLam 330R10 offers a cool down cycle and all you have to do is press and hold down the power button, and the cool down cycle is activated. The cooling fans will continue to run until the machine has reached the correct shut down temperature and then when the system is cooled it will automatically shut itself off thus preventing damage to the heated rollers. With the easy to remove top roller cover it makes maintenance on the system very simple. The LCD display features controls for temperature, speed, reverse, hot and cold, counter and reset memory and measure. The SpeedyLam 330R-10’s feed opening is 13 inches wide, so you’ll be able to laminate documents of all different sizes. With this machine it is possible to laminate legal-sized documents and I.D. cards and everything in between! If you have any questions or are interested in the SpeedyLam 330R10, visit us at SpiralBinding.com. 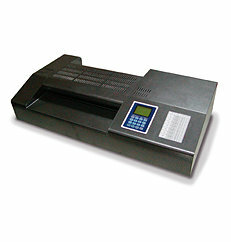 We have great pricing on a full line of Pouch Laminators. Call us at 1-800-631-3572 for more information!